Originally from Czechoslovakia, Estair grew up in Belgium where she studied fashion design and fine art. To this day, Estair paints professionally, creating intricate paintings that fuse harmony and wholeness (see www.estair-kaufman.com and www.torontoimageworks.com/esthair ). From the age of 18, she developed an interest in health, also with a relationship to wholeness. This set her on a beautiful journey, developing as a healer and becoming a mother of four. Working as a labor coach, she learned how to make space for the magnificent essence and potential of people to unfold, which was a magical experience for Estair. This then led her on a path of mind- body connection and studies of Dr Sarno's approach and Nia (see below for a description of Nia). She learned Psycho-Spiritual therapy with Efim Svirsky as well as energy medicine approaches including T.A.T. (Tapas Acupressure Technique), E.F.T. (Emotional Freedom Technique), Quantum Techniques (wwwquatumtechiques.com) and Reconnective Healing. Estair is happy to meet on-on-one during the retreat. Five years ago, Estair became a Nia instructor. Based on a fusion of Western and Eastern philiosophy, Nia (Neuromuscluar Integrative Action) works to integrate the mind, spirit, body and emotional being. A blending of movements from modern dance,Tai Chi, yoga, jazz dance, Tai Kwan Do, Aikido, Duncan dance, Feldenkrais and The AlexanderTechnique – Nia improves muscle tone, concentration, posture, reduces stress and imbues a state of happiness and inspiration. It looks like dance, feels delicious and is loads of fun. Estair has taught Nia to groups of women in Toronto and Israel. Susan Zehavi, D.Ac, has been a Healing Practitioner for over 15 years. Sparked by a need to heal herself, Susan studied Traditional Chinese Medicine, Cranial Sacral Therapy, Nutritional Counseling, Lymph Drainage Massage, Iridology, TuiNa Massage, PsychoSpiritual Healing from a Torah perspective and Principled Living, a method of finding your own health from the inside out. Her integrative techniques help people who need to blend conventional and alternative medicines, with a goal to help everyone live life to their fullest potential. Joy has been practicing yoga for 18 years and she teaches a combination of Iyengar, Ashtanga, and Yin Yoga. She also offers Cranialsacral Therapy and Swedish Massage In which she incorporates acupressure, foot reflexology and craniosacral therapy into her massages. Joy's training is through the UCSC Holistic Health Program. (University of California at Santa Cruz). Joy works on women of all ages and with different physical issues. Chava Rachel Saban began to play the violin at the age of four. At eleven, she also began to play the flute. After studying classical music in various conservatories, she worked as a professional violinist in the New Haven symphony orchestra. At the age of 21, a car accident changed the course of her musical career. Chava Rachel began to heal both her body and soul through her own voice, harmonizing with her violin. Today, Chava lives in Tzfat with her husband and growing family. She has produced six CDs and teaches violin, flute, and voice to children and women. Chava Rachel has adopted a healthy lifestyle and her children are home-schooled. She utilizes her gift of music as a form of prayer and feels that when she is singing and playing, she is helping to bring about the promised Redemption of the Jewish people. Allison Ofanansky was born and raised in the US, where she first became involved in environmental and social activism. In 1996 she and her husband Shmuel made aliyah and began organizing ecological activities in and around Tzfat. She helped to found the non-profit Center for Healthy Living in Tzfat. Allison offers ecology and "eco—peace" activities for children and adults through the Center and at various festivals and community events. She is the author of three children's books and works as an editor of academic books and articles. She lives with her husband and daughter in Kaditah where she enjoys hiking, gardening and harvesting and eating the fruits of the seasons. Light, color, joy and depth define the work of Tzfat artist, Sheva Chaya Shaiman. Sheva Chaya grew up in Denver, Colorado, where wide open skies and the majestic Rocky Mountains inspired her to begin her career as an artist. She studied at Princeton University, majoring in visual arts and art history, with a concentration in painting. After graduating from Princeton in 1997, Sheva Chaya immigrated to Israel. There, the land, the people, and a rich tradition of spiritual teachings brought a new, deeper dimension to her work. 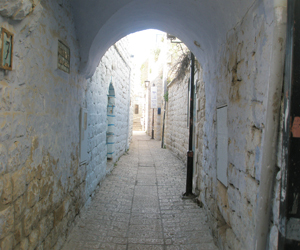 Sheva Chaya now loves living in the Old City of Tzfat, Israel, with her husband and five children. Sheva Chaya is a glassblower as well. As she blows glass into shape before your very eyes, Sheva Chaya explains the inner mystical levels of glass. She explores this is reference to expanding our consciousness and deepening our understanding of our relationships with others. A native of Israel, Smadar graduated from Tel Aviv University with degrees in both Literature and Middle East studies. She also received certificates in both Aromatherapy from the Reidman College of Complementary Medicine, and certificates for Classical Homeopathy from Medicine School. Smadar has a wealth of knowledge and experience in Naturopathy and loves to share this with her clients. From an early age, Smadar has had a passion for dancing - particularly in both modern dance and classical ballet. She danced with the famed Bat-Dor ballet company for a few years. Part of her training as a dancer included instruction in Pilates. After the army, Smader was hired as one of the instructors at the first institute of Pilates in Israel. In conjunction with the Bat-Dor ballet company. Smadar was fortunate to have learned with a master instructor who had been a student of Pilatus - the originator of the Pilates method. Smadar, one of Israel's premier instructors of Pilates, has been teaching for close to thirty years. The most rewarding aspect of this experience has been her role as a true healer. Through this physical body work, Smadar is given the opportunity to reach each participant and to partake in their individual healing of mind, body and soul. About twenty years have passed since Imke Halpern relocated from Europe with her husband, mother-in-law, and eight children, choosing to settle in Kadita, a small village in the Galilee mountains between Tzfat and Meron. Imke and her family have since established an "ecological mind" on the piece of land they care for. With assistance from neighbors, they have established a water recycling system, composting, high gardens, a biological composting toilet, rainwater collection, and a wind turbine. In 2001, Imke's husband passed away, and from then on, Imke focused primarily on her small organic tofu production workshop to support her family. Imke has taken advantage of medicinal herbs to heal her family and others throughout the years. Imke is creative and resourceful and is always involved in methods of home production such as growing organic vegetables, creating herbal essences, sewing, felting, and bread making. David Friedman grew up in a Modern Orthodox home in Denver Colorado. He became interested in art at an early age, and this became quite serious by his teen years. David was mostly inspired by the artwork of album covers and mystical art, such as Eastern mandalas. David attended art school, however he left after one year to pursue the study of Torah and Jewish Mysticism. David moved to Israel as a young adult and continued his Torah studies, his art, and combining these two passions. David developed an original system of translating kabbalistic concepts into graphic shapes and colors based on sacred texts. In 1987, while living in Tzfat with his wife Miriam and his growing family, David was diagnosed with cancer and underwent months of chemotherapy. To heal from this, David began practicing meditation and discovered Jewish meditation. He also began practicing yoga and eating healthy, thanks to his wife Miriam. Miriam is now a popular yoga instructor in Tzfat. The Friedman's have a gallery of "kosmic kabbalah art" attached to their home in the old city of Tzfat. David also frequently gives lectures to groups on Kabbalah and Jewish Meditation.